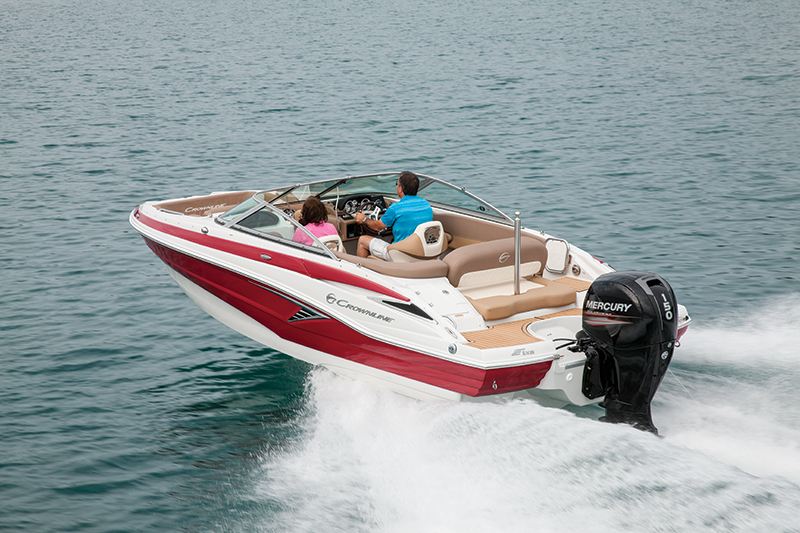 Crownline’s motto, “Our standards are their options,” is spot-on when it comes to the E 215 XS. The upscale standard features rolled into its nationally advertised price of $46,995 include a six-speaker Kicker Bluetooth stereo, a Mercury 150 FourStroke with SeaStar hydraulic steering, a depthsounder and a twin-axle galvanized-aluminum EZ Loader trailer with disc brakes. For relaxation at rest, a stern sunpad has a three-position backrest and conceals a huge storage compartment underneath it. 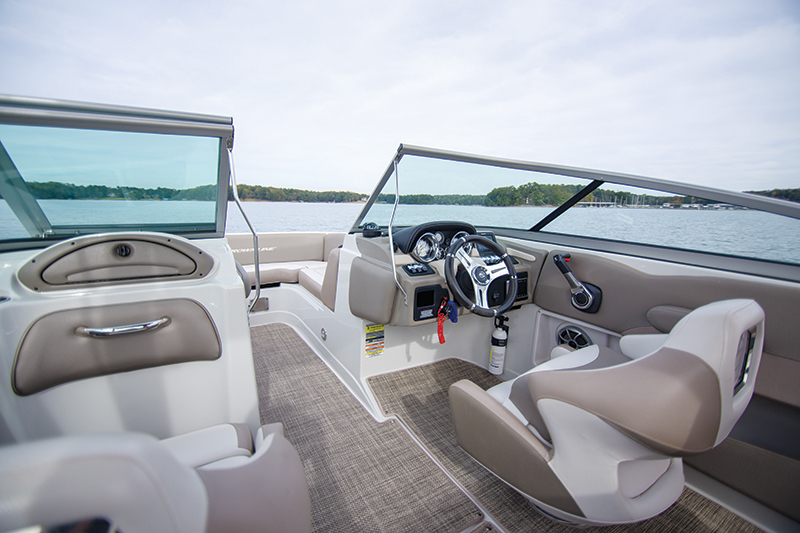 Some other value-added features include snap-in Highlander carpet, a swim platform clad in Soft Touch and a color-matched Bimini. The Crownline E 215 XS (formerly the E 21 XS) is well-suited for cruising and watersports thanks to a range-extending 45-gallon fuel tank. Stretching to 21 feet, 4 inches long and 8 feet, 6 inches across the beam, the E 215 XS has plenty of interior space and enough seating to carry the 11 passengers it’s rated for. 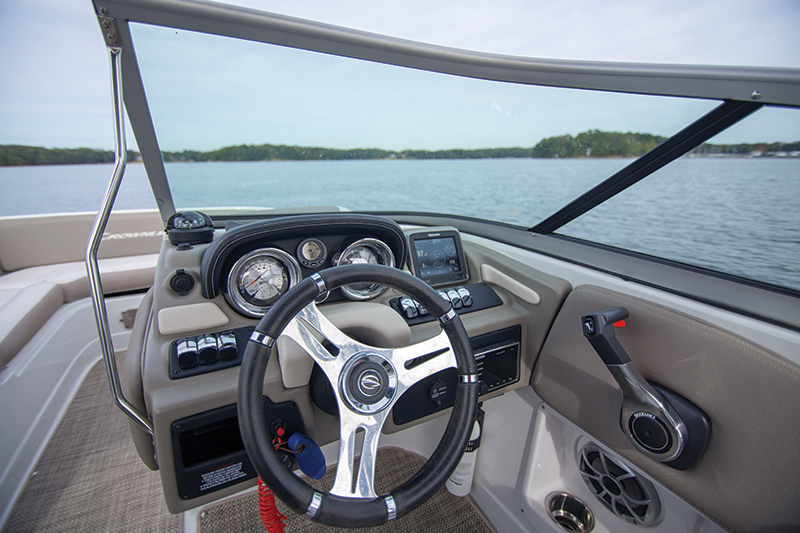 The cockpit features an L-lounge with a Soft Touch–padded portside walkthrough, and twin captain’s chairs have flip-up bolsters. New this year, the standard upholstery is called Pure Platinum and is a two-tone gray. Also new is the Royal Champagne interior option ($958), which features a Pearl White interior with Camel and Dark Oak accents, an Executive Oak wheel and a teak-look swim platform mat. 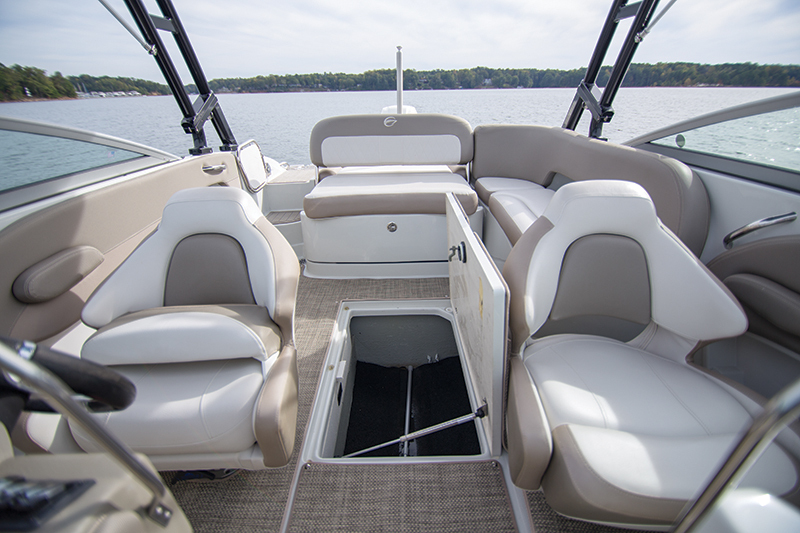 The E 215 XS’s beam is carried far forward to create extra room up front, and a bow filler cushion ($475) is an option. 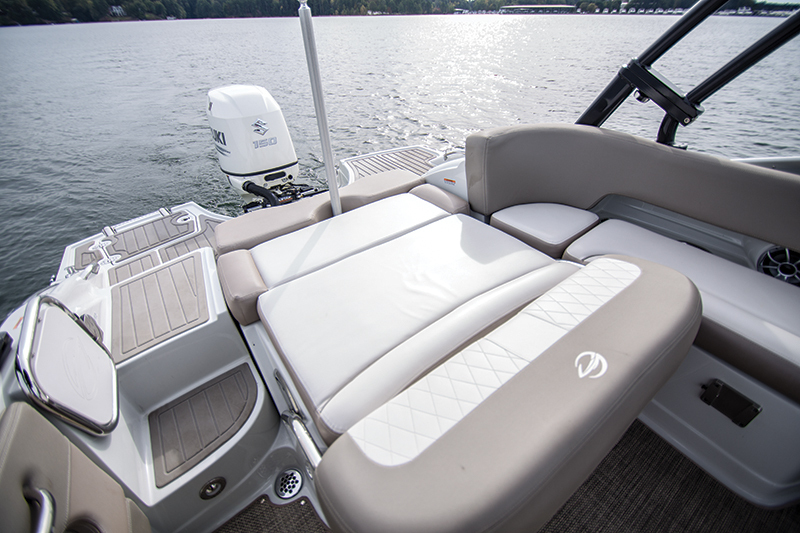 Flip-up armrests for the bowrider chaise lounges are standard, as is the side-mount table that can be installed up front or in the cockpit. The table has a dedicated storage spot in a slider drawer that resides in the deep centerline storage locker. Our test boat was powered by an inline four-cylinder Suzuki DF150, an outboard whose large 2.9L of displacement doesn’t keep it from being one of the lightest 150s on the market at 522 pounds. Suzukis are known for their low-end torque, a plus for towing skiers, and the DF150 put our test boat and its stoutly built 4,060- pound F.A.S.T. TAB vented hull on plane in 3.7 seconds with little bowrise. The E 215 XS reached 30 mph in 9.5 seconds and topped out at 42.0 mph, but buyers who want more speed can equip it with up to 250 hp (from Yamaha, Suzuki or Mercury). 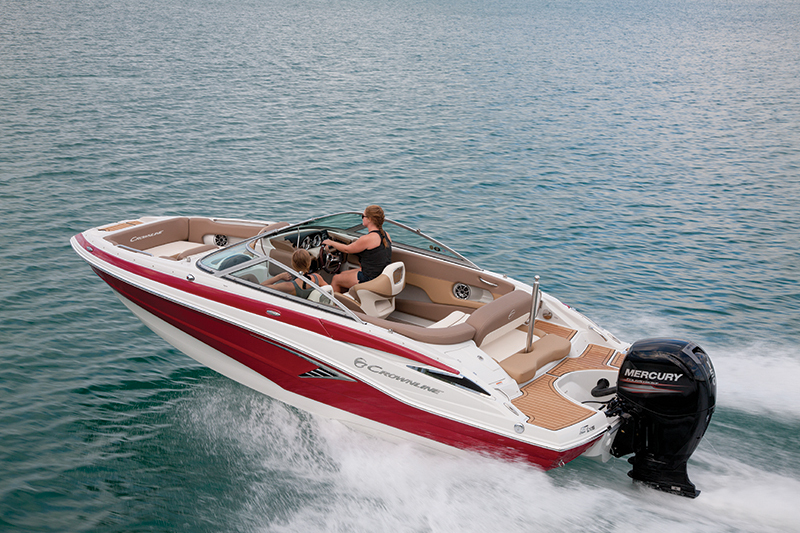 The vented hull design allows it to attack hard turns without losing much traction. LOA: 21 ft., 4 in. Time to Plane: 3.7 sec. Time to 30 mph: 9.5 sec.